“She’s absolutely perfect at her profession, and that is very rare–not just in sports but in all things. It’s difficult to win even one race, let alone 18. “She always makes me think of those great war beasts of Greek sculpture, or the beautiful horses carved on the Parthenon. She is absolutely enormous–not only very tall [more than six feet from the top of her head] but also very broad, very muscular. She is simply drawn on a different scale from other racehorses. “In just about every race, she starts out last and then comes flying at the end, breaking her opponents’ hearts. The crowds love it. She clearly knows exactly where the wire is. And she has such a huge stride, it looks like she’s moving slowly when she’s actually covering a lot of ground very fast. We haven’t seen how fast she can really go, because she only goes fast enough to catch the other horses at the wire! — Laura Hillenbrand, author of 2001’s best-seller Seabiscuit, “The 2010 O Power List”, O, The Oprah Magazine , October 2010. 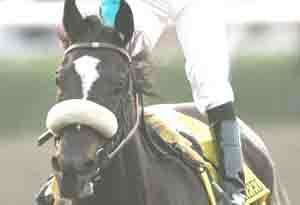 The iconic six year old Thoroughbred race mare who has stormed down every homestretch to victory, eighteen times. And twice in the World Championship Breeders’ Cup series. She’s preparing to take an unprecedented third Breeders’ Cup World Championship title in November. 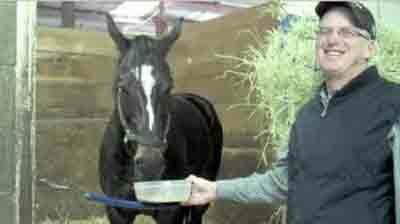 Clearly besotted with his charge, trainer John Shirreffs strapped a camera to the helmet of Zenyatta’s exercise rider so her fans can experience the view from the back of a champion. Enjoy the ride!